Following my initial story which I released a few weeks ago, I finally have the opportunity to update you on the first upgrade that is being installed on my BMW M2 Competition, which is currently in development. The Slovenian master builders at Akrapovic have had my car for the last few weeks, which was only roughly 1.5 weeks after I collected it from the dealer. In that period, the engineers and specialists have worked on the development of the most requested upgrade that any M2C owner has begged for the last few months. In my opinion, “the well-engineered titanium exhaust system available to mankind”. Yes, I know I am exaggerating a little bit now, but that is mainly because I am extremely passionate, due to my personal aerospace engineering background and my sheer interest in any high quality technical development. The amount of replies, questions and direct messages I have received in the past few weeks have showcased the sheer interest in the exhaust system and desperate requirement from owners for an upgraded system that provides a much needed, improved sound track. Before we start the process of discussing the current development of the new exhaust outline, it is key to mention that the current M2C line up exists of two key model versions; the EU and non-EU model. Due to the implementation of new emission standards by governing bodies in Europe, aftermarket exhaust manufacturers have been faced with the installation of OPF filters on numerous new cars, – like the M2C, restricting the exhaust flow and therefore the exhaust tune or note. 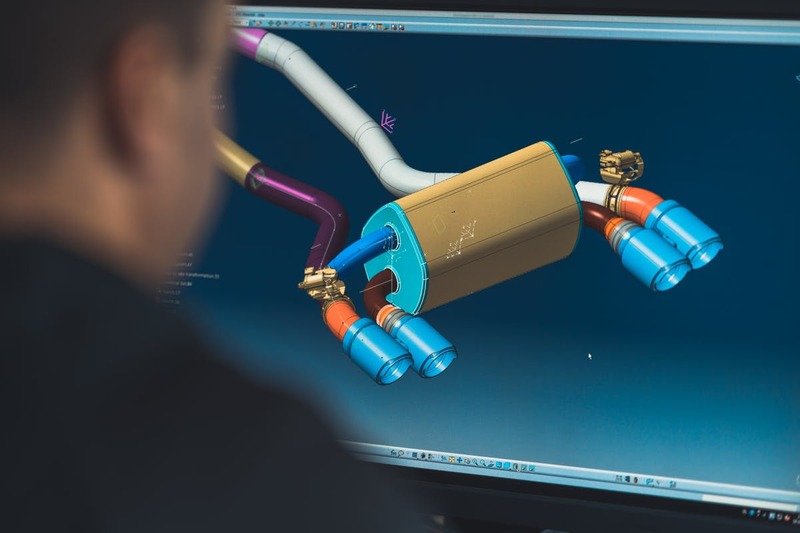 This is currently only happening in Europe and it means that different versions of future exhaust systems will be offered to different markets, having impact on prototyping and testing for cat-back systems considerably. This is not unique, it will happen across the complete aftermarket exhaust world. With this branded in our minds, let’s run through the development process of an exhaust and what it means for the engineers in Slovenia to develop a new exhaust system. After the vehicle arrived at the headquarters and the handover was completed, the development process started in a 3D CAD/CAM environment. The engineers created a 3D scan of the reference car’s underbody with the original exhaust still fitted on the car. The second step is that a prototype configurations are then developed and evaluated on a chassis dyno, measuring torque, power, temperatures, and back pressure. The engineers in the workshop and prototype department also investigate the fitment, design, weight loss and sound of the new system. 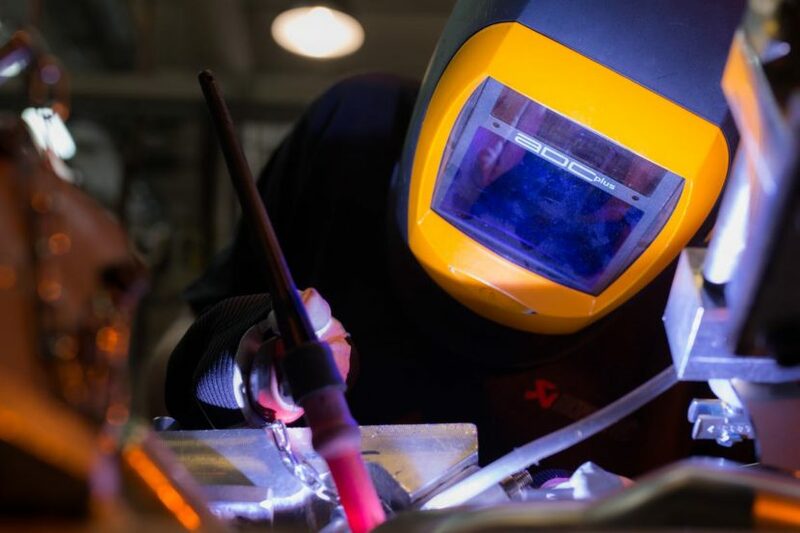 To create the initial prototype, Akrapovic use their own in-house titanium foundry to make the complex parts. On the photo below, you will see the molds for the titanium flanges used for the M2 Competition exhaust. Through the use of over 20-years of in-house knowledge and technologies in handling special materials for exhaust systems, such as titanium, stainless steel, and aluminium alloys, the specialists have an immense attention to detail and use the highest grade of base materials. Their own metallurgical laboratory, located less than ten meters from the foundry, allows them to choose the best titanium alloy possible for the exhaust. 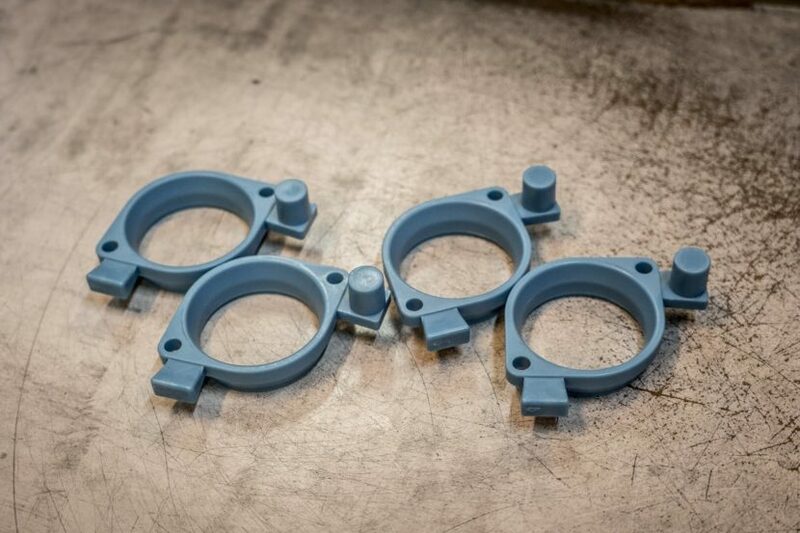 During the development and ahead of the release many different tests are done in this department making sure that the best possible quality and fit are being achieved. With the current development on-going, I am happy to share that Akrapovic has confirmed that a final prototype of the slip-on titanium exhaust system will be part of the final program for the M2C. Their plan is to have it ECE type approved, similarly to the BMW F8x M3/M4. The slip-on, backbox or axle back (whatever we want to call it) will be made of titanium, has an optimised shape and provides the best possible sound under the ECE type rules. 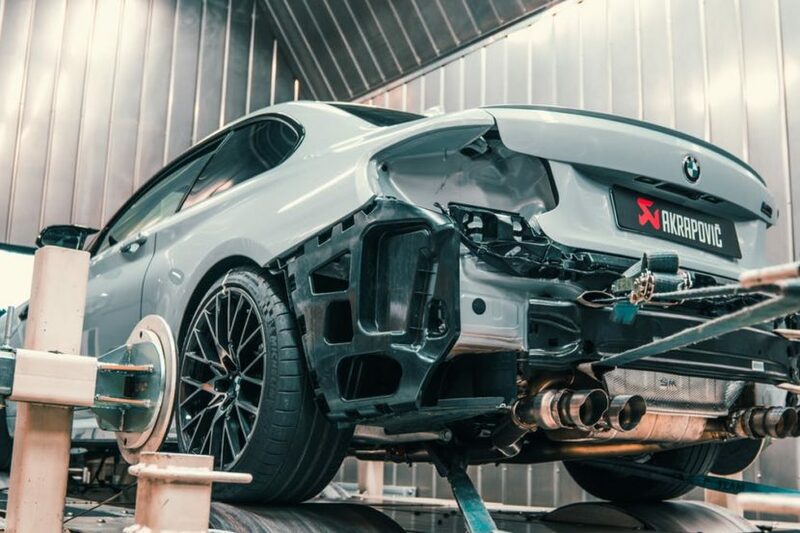 Akrapovic have stated that while the car was being dynoed, they played with a different sound than stock, using their in-house sound engineering. Next to this, a link-pipe prototype has been tested and will also be part of the program. The link-pipe will be an immediate replacement for non-EU cars which are meant to be driven on track. Testing has shown that EU M2C’s with OPF filters will have to tune the ECU software of their cars when they want to fit the replacement link-pipe. Catless and sport downpipes are still under consideration, more information on these will follow at a later stage. On the subject of other additional parts, I can share that both tailpipe designs will carry the Akrapovic design language, similarly to other Akrapovic exhausts for BMW M cars. They will be available as carbon fibre with titanium inlets. The carbon fibre diffuser and carbon fibre mirror caps are immediate fits to the car. Both will be available for customers. This leaves me with the question that you all want answered right now, preferably yesterday; when are all these parts available? The carbon parts will be available relatively soon. The slip-on exhaust and link-pipe will be available before Spring 2019, once further testing and ECE homologation has been completed. Prices have not been communicated to me yet. The availability of the downpipes for both the EU and U.S. market is unknown at this stage, due to ongoing development and testing. I will touch on the subject of the downpipes in my next update, which also includes a few more details on the slip-on prototype exhaust system, a sound file and a dyno video. For those interested in the new titanium exhaust system, the new Akrapovic slip-on system for the M2C will be on display at the two-yearly Tuning Day held on the 30th of November at the Akrapovic dealer Beek Auto Racing in the Hague, the Netherlands. I am on site and will happily take you out in my M2 Competition so that you can hear the prototype system fitted to my car. If you have any questions, than please feel free to share them below and I will try to come back to you on them as soon as I can.